For more than four decades, PEN America’s Prison Writing Program has amplified the writing of thousands of imprisoned writers by providing free resources, skilled mentors, and audiences for their writing. 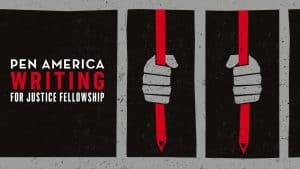 We are proud to share our deepening commitment to confronting our era of mass incarceration with the launch of the 2018 PEN America Writing For Justice Fellowship. Read below for more information about our initiatives. For information on writing programs in prison across the United States, check out our living document database. Founded in 1971, the PEN Prison Writing Program believes in the restorative, rehabilitative and transformative possibilities of writing. We provide hundreds of imprisoned writers across the country with free writing resources, skilled mentors, and audiences for their work. Our program supports free expression, and encourages the use of the written word as a legitimate form of power. We strive towards an increasingly integrative approach, aiming to amplify the voices and writing of imprisoned people to expand beyond the silo of prison, and identity of prisoner. Download a printable PDF copy of our offerings. PEN’s Handbook for Writers in Prison features detailed guides on the art of writing fiction, nonfiction, poetry, and screenplays—an invaluable resource for any writer. Each year, thousands of free copies are sent to incarcerated men and women. Every year hundreds of imprisoned writers from around the country submit poetry, fiction, nonfiction, and dramatic works to PEN’s Prison Writing Contest, one of the few outlets of free expression for the country’s incarcerated population. Consisting of more than 250 mentors working with close to 250 incarcerated writers, PEN America’s Prison Writing Mentorships continues to be the most interactive and engaging project in the Prison Writing Program. The Prison Writing Contest Prizes are sponsored by the generous support of the Greenburger Center for Social & Criminal Justice. Programming for PEN America’s Prison Writing Program is made possible in part by generous funding from the Stavros Niarchos Foundation.